Variegated shell ginger, Alpinia zerumbet ‘Variegata’. Alpinia zerumbet is a tender herbaceous perennial in the ginger family (Zingiberaceae) grown throughout the world for its attractive flowers and foliage. 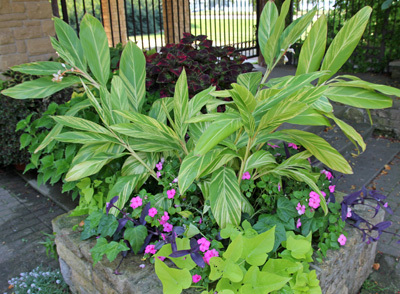 This plant native to open woodlands of tropical eastern Asia is frequently used as an annual foliage plant in colder climates, with a variegated cultivar native to India the most common type available in the Midwest. 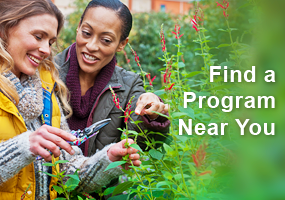 It is winter hardy in zones 8-10, although it may survive in zone 7 with winter protection. 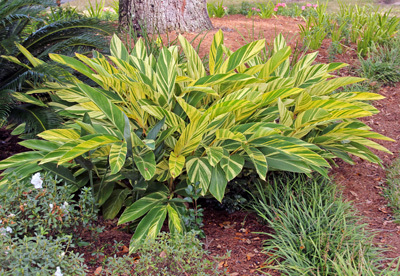 Variegated shell ginger is widely used as a tough landscape in mild climates. Plants grow in upright clumps from heavy, fleshy rhizomes that look (and smell) like that of culinary ginger (Zingiber officinale). The rhizomes produce stout, slightly arching stems with evergreen leaves. 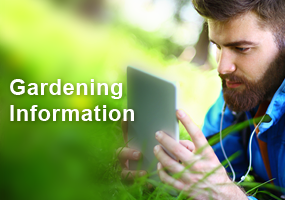 Several dark green, lance-shaped leaves up to 2 feet long grow at intervals along the stems. Variegated shell ginger is often grown as an annual in cool climates. The species can grow up to 10 feet tall, but in gardens, and especially in northern areas where grown as an annual, they generally only get 3 or 4 feet tall. The cultivar ‘Variegata’ is a smaller, more compact plant featuring boldly, irregularly striped foliage. 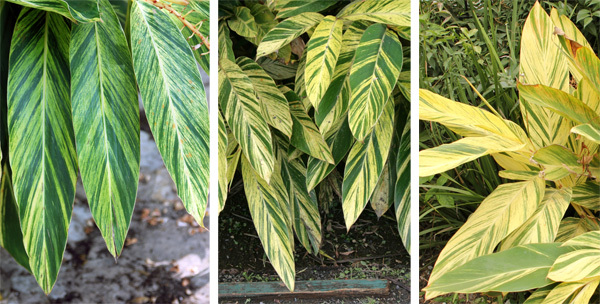 The leaves vary considerably in the amount of variegation, with some mostly green streaked with creamy yellow or gold, whereas others are primarily yellow with some green stripes. The amount of variegation on the leaves varies a lot. Alpinia zerumbet produces an inflorescence on old growth, so flowers are usually not seen on plants grown as annuals or stored for the winter. Unlike most gingers, this species produces drooping racemes at the ends of the leafy stems rather than directly from the rhizomes. The waxy, funnel-shaped flowers are a pearly white tinged with light pink on the outside, but inside are bright yellow with red markings. It is the appearance of the flowers which resemble pearlescent seashells, especially when in bud, that inspired the common name of shell ginger. The flowers are slightly fragrant when in bloom. Sometimes flowers are followed by striated fruits. Alpinia zerumbet produces flowers in a terminal raceme (L), with drooping white flowers (LC) that each have a yellow and red interior (RC and R). 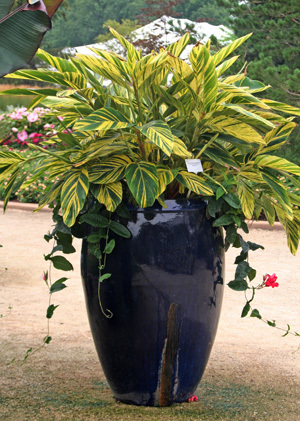 Variegated shell ginger makes a striking addition to containers. Variegated shell ginger can be grown in large containers as a houseplant or patio plant (alone or in mixed containers) for a tropical effect. It can be planted in the ground as a striking specimen plant, or in masses as a bright backdrop for other flowering plants. Variegated shell ginger in a mixed planting. Combine it with dark foliage for dramatic contrast, and use it to brighten up a lightly shaded area. 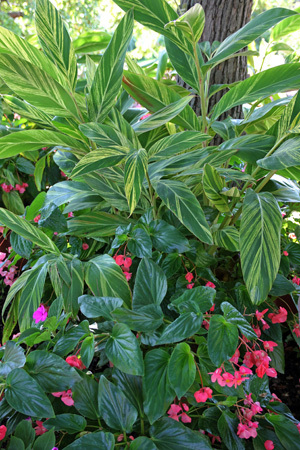 Mix variegated ginger with banana plants, castor bean (Ricinus communis) and elephant ears for an exotic foliage garden. Grow variegated ginger outdoors in rich, moist soil with lots of organic matter in full sun to part shade. Wait until the threat of frost has passed to move containers outside or to plant in the ground. Variegated shell ginger in a seasonal container. Provide plenty of water during the growing season and do not allow the soil to dry out (but it shouldn’t be constantly soggy either). 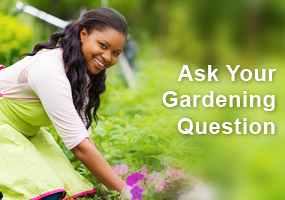 Plants in containers should be fertilized at least monthly. It has no significant pests and is not favored by deer. Rhizomes can be dug and stored over the winter. If keeping over the winter, they should be lifted after the first frost and stored in a dry area around 55F. 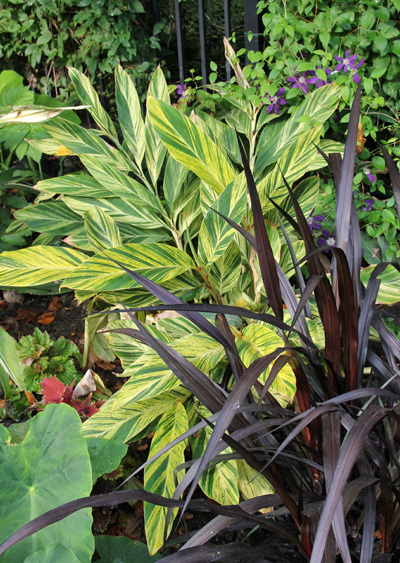 Combine variegated shell ginger with other plants with dark foliage for a dramatic effect. 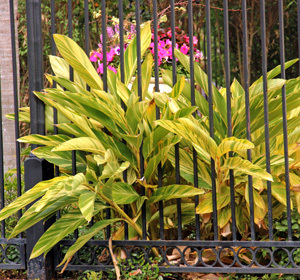 As a houseplant, variegated shell ginger needs bright light and does best in humid conditions. The leaves will brown on the edges if it does not have adequate moisture or gets too cold. Plants can be divided if they get too large for the container. Shell ginger is usually available as potted plants, but sometimes can be purchased as bare rhizomes (which should be planted about an inch below the soil surface). 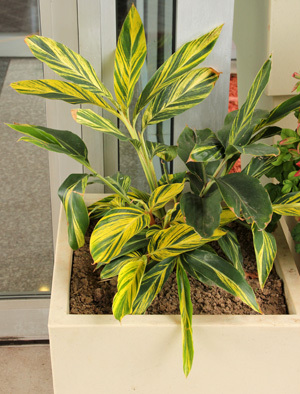 The most commonly available cultivar is ‘Variegata’, but sometimes others can be found, including the even smaller cultivar ‘Variegata Dwarf’ which grows only to about 1 foot tall, but has the same green and yellow variegated foliage, and ‘Variegata Chinese Beauty’, which has light green and dark green marbled foliage and can grow up to 8 feet tall. I can’t seem to get my shell ginger to grow in any circumstances. The stems get soft, soggy feeling and droopy and the leaves turn brown and die. I’ve tried light. I’ve tried shady. I’ve tried ample watering as well as drying between watering. I keep indoors. The plant is almost gone.I trim the dead. I’m down to roots and dirt. Can I save it? I have beautiful salmon colored huge blooms on my tall ginger plants now…they perfume the whole front of my house…I do not know what kind of ginger they are but they like dappled sun/shade. What variety are they and can I bring in a pot to my sun room for the winter to have them bloom inside to fill my home with ginger fragrance? Is the bloom time set in their DNA? I have never seen flowers on my alpha variegate ginger plants. When do they bloom?